It was a short gap between the opening round of the FIA GT Championship and the latest round at Brno for the Spirit Motor Group-backed Balfe Motorsport team. The plan before the Czech event was to get as much work done to the Saleen S7R as possible, to narrow the gap to the rest of the GT1 field. To find itself so far away, with a car that didn’t do what the drivers wanted it to do at Silverstone, was disappointing. However, the team knew the areas that needed work and the majority of the job list was completed before the truck left for the haul to Brno. The only problem was, the first time the team would know if it had closed the gap would be in the opening session at the circuit. A complete damper change had made a significant improvement to the car, meaning that the drivers and engineers could now make it do what they wanted and it responded, which was a bonus for the start of the weekend. Both Jamie Derbyshire and Shaun Balfe were still struggling on the exit of corners, but the initial changes the team had made were a step forward. But the proof that more work still needed to be done was the second free practice session, where the GLPK Corvette and the Zakspeed Saleen showed what the ultimate pace truly was, once again seemingly putting the Balfe squad further out of reach. The car certainly isn’t slow. The team glanced at the speed trap figures and the Balfe Saleen was the second fastest over the start/finish line. The problem the drivers were having was getting the power down. A lack of traction control, or at least a fully functioning version of it, wasn’t helping. This and the lack of grip, are the main issues that team will be looking at over the long break between Brno and round three at Oschersleben in Germany. The race day warm-up proved a little bit tricky for Jamie Derbyshire. With torrential rain falling, he was finding it hard to get to grips with the car, until he and the Saleen got settled in later in the session. But he was also suffering from a misting windscreen, which meant he was unable to see any braking points in the first half of the short 15-minute session! A heated unit was installed for the race, in case the weather stayed the same: luckily by the time the race began it wasn’t needed. The opening section of the race went well for the team. 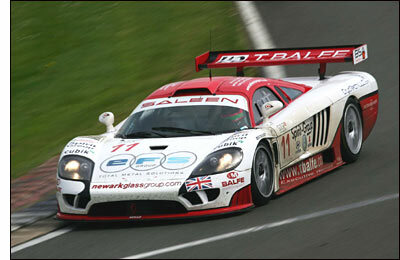 Shaun Balfe managed to stay with the rest of the GT1 cars for a couple of laps, before they began to pull away. However, he did manage to move up a couple of places as the guys at the front got too over-excited and threw themselves into the Czech gravel. On one-third distance, Shaun handed over to Jamie and he went out for the middle stint of the race. He managed to settle in quickly and got straight into a rhythm, before he radioed to the team that he had started to feel a loss of power. The team called him in and immediately downloaded the engine data to see if there was anything terminally wrong. What was thought to be a swift fix was done in the pit-lane, before he was sent back out again. Unfortunately, it didn’t (fix it). Jamie was back in a lap later, and this time he reversed into the garage, as the mechanics swarmed all over the rear end of the Saleen. As the clock ticked away the team decided that Jamie should stay in the car to the end of the race, meaning that with the stops for the mis-fire, they wouldn’t have to stop again. The car was wheeled back out onto the pit apron once again and as Jamie left the pits he initially thought it was clear. But as soon as he opened it up on the circuit, it was apparent that the problem was still there. As a precaution, the team decided that bringing it back and calling it a day was the best option, saving the engine in case anything major was amiss and looking forward to testing and getting everything right before round three. Jamie Derbyshire was frustrated by the non-finish in Brno, but was also happy with the step forward from the car between races.